Today I want to show this Emily polish from Born Pretty Store in Sweet Pink. I'm going to be honest straight away, I only wanted to try this polish because the bottle is adorable. The first thing that is noticeable about the polish is the smell. It is really strong, maybe not Kleancolor strong but it's pretty strong, which I was surprised about because on the item page, it does clearly state 'no smell'. On the box it also says scented but I am not sure if it is, other than the initial polish chemical whiff. I found that it was really easy to grip the novelty lid but the brush is a little short, it didn't affect application and I don't think it will have a problem reaching the bottom of the bottle because the bottle itself is a little square, stumpy one. It applied quite nicely really, I think it is a jelly and it has subtle holo dust, which in normally lighting, looks like a silver shimmer. Dry time is pretty average, it no 60 seconds but it only takes a few minutes at most. It dries to a smooth semi matte finish. You can find this nail polish here for £5.63 ($8.64) along with the other designs. I'm not sure about the price, it does seem a tad high for this type of novelty polish, it is quite a pretty polish though, it's just a shame about the smell but then it would be cute to have one of each design. 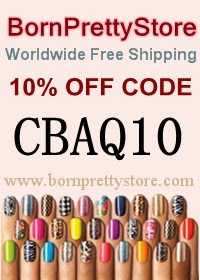 As always, don't forget to use my discount code CBAQ10 for 10% off your entire basket amount. What are you wearing on your nails this weekend? The nail polish in this post was sent to me for review purposes. All opinions expressed are my own honest opinions.